Microsoft has revealed its Windows 8 licencing charges to manufacturers, and the amounts seem to be in line with the concept of the cheapo $40 upgrade to Win 8 it announced recently - the upper limit is $80-$100, and that is for a full-fledged Windows 8 Pro with Microsoft Office licence. 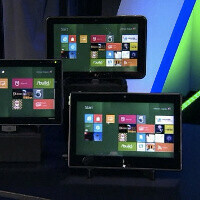 We are most interested in the Windows RT version for ARM-based tablets licensing fee, which will be part of these slates' cost structure, though, and that one is set at $50-$65, which is not bad at all, considering that this version of Microsoft's newest operating system comes with a free edition of Microsoft Office, tailored for your tablet and touchscreen realities. With Samsung rumored to out an RT slate come October when Windows 8 ships, and Microsoft coming up with its own Surface tablets, the game is about to get heated for the holiday season, and hopefully this will lead to better prices for Win tablets with full-fledged Microsoft Office. Tablet maker should never use Microsoft RT wasting money and no profit, Android is the top OS. I totally agree - Android is way better. But I think that the Metro UI is good for first-time tablet users. Android is a phone-based mobile OS. Windows 8 is a computer based OS that can run on a compatible mobile device. Android is good for phones, and OK for mobile-based tablets, but in terms of capability, it doesn't come close. Now if you were comparing Android and Windows Phone 7, you might have more validity to your argument. Crystal clear comment. Nothing else needed to be said. I disagree with you. Windows RT is not Windows 8. It will not not come close to Android 4.0 or 4.1 and I really mean it. It will lack applications and legacy desktop applications will not run on it. An OS is nothing without applications. Linux is far more better than Windows but lacked applications. Android has far more applications than Windows RT. Office RT is a subset of Office 2013. Android has Quick office which is MS compatible and does cover all my needs. Since I use Android tablet, I don't have to use my windows desktop. Right now and based on what I know, I will not buy a Window RT tablet since it will cost me more with likely much less capability. Not to mention that I will not be forced to use exclusively IE which is not my favourite browser. Android is gona go down the same path as symbian in future mark my words. not dreaming my man android is all fire now eventualy the reviewers is going to negatively crit android for some reason and they will start to steadily decline windows phone is the future. Windows Phone fills one niche... ease of use. The same niche that the iPhone already fills. Android is available in a variety of phone models from cheapo bottom barrel to top of the line iPhone competitor models. Also, Windows Phone is going to catch on fire? When? They have been practically throwing the phone at people -- even the top end model was $99 on contract and reduced to free at one point, it was one of the most well reviewed phones and Windows Phone gained... .1% of the market. Windows Phone 7 is just ugly after you look at it for a while. You start to ask why do I need tiles that are built for blind people, they are too large and moving through screens isn't as natural as it is on the iPhone or Android. Well, your opinion seems to be passing for fact. "Windows Phone 7 is just ugly after you look at it for a while." Nope, no bias there. The more I look at my slick, organized the way I want it Metro the more I like and appreciate it. "it was one of the most well reviewed phones and Windows Phone gained... .1% of the market. " Completely wrong. WP has gained in every market it is being offered in. 5% and climbing in the US, sales growing everywhere else (no firm numbers lately, so I won't make them up). Are these huge sales numbers? Nope. But you know that old saying about not looking behind you because something may be catching up? ".....they are too large and moving through screens isn't as natural as it is on the iPhone or Android." Spoken like a person who prefers Android. Fair enough, and more power to you. But from Blackberry to iOS to even the mos recent versions of Android, they all move and "feel" exactly the same way to me. Sliding down to where I put whatever Tile I want is way better. "Also, Windows Phone is going to catch on fire? When?" Here is the question, huh? Well, how about when it's cross platform with the best selling game system (XBOX) and best selling home and working computer software (Windows) is pushed? How about when Tablets finally take off like when they are supposed to, and Microsoft's version is at or near the top of the list. Sorry, but if you are looking at Android objectively, the ONLY other Tablet to sell besides the iPad is the Kindle Fire. No Android tablet has broken through. That leaves a HUGE market wide open. And Windows RT and Pro will have an excellent chance to fill that void, finally burying the notebook, challenging in schools and libraries as the educational option over text books (Barnes and Noble is a partner in this), and capitalizing on the Tablets current user base: gaming and entertainment. In other words: Microsoft's ecosystem (PCs/laptops, XBOX, work software, excellent cloud systems, ect) will bring people naturally to Windows Phone. MS can afford to be patient so long as Windows 8 products are launch correctly. And, WP will never upend Android as the top selling phone OS as long as Google doesn't get fat and lazy, mostly for these reasons: "Android is available in a variety of phone models from cheapo bottom barrel to top of the line iPhone competitor models." Couldn't agree more. Android is also open sourced, and an endless playground for developers, with an established consumer base. But, with BILLIONS of handsets sold each year and growing, there is plenty of room for WP to thrive. Yes, it can. But it is not anywhere near the function or details of Office, which has nearly 20 years of a head start. Professionals and people who need top notch documents will still pay for the best. Google Docs are nice, and priced right. MS better keep an eye on them. But Office is still comfortable ahead in that area. I have an Android tablet and Kingsoft Office. As much as I love my tablet, Android and Kingsoft can NOT do it all. I use documents with embedded files in them... Kingsoft does not open them. OfficeSuite Pro does not open them. I realize that I may not be the typical tablet user, but at this point there is no way that an Android or iOS tablet could completely take the place of my laptop. Windows RT may just be able to do that. It can do a lot, but I wouldn't even dare consider "a lot" to be "all". If I were creating a document for work, or were I in college again going for another degree, I'd use a desktop computer to do it, so that all the native capabilities are available to me, rather than wasting my time trying to do the same on a "lite" version of the same or equivalent program. Now if I were out and about and I were suddenly struck with an idea or concept I wanted to put more into, then a phone or mobile-based tablet would suffice until I got to my computer to really work on it, as the phone or tablet would take the place of a paper notebook with what I have on my person at the time. That said, I'd rather have a desktop based tablet device that I could do everything on instead of switching devices, or use a single OS and simply switch what device I'm using the same full OS on. Windows 8 will be the only ecosystem that will allow that, and the only known competitor that might be able to come up with a similar experience would be Linux, not apple. This is a decent price. A good starting point. I do worry about Windows Tablets being too expensive to appeal to consumers right off. Better to break even and have immediate success than try to force something that is proven to fail if priced to high. Agreed! Based solely on component coat and OS licenses, Microsoft and its hardware partners should be able to price these very competitively. I hope they price RT tablets under $500 ($250 I would imagine to be the lowest, as that's netbook territory, and touchscreen tablets tend to be pricier to produce than a netbook), and Pros starting at $500 and up, priced around entry level notebooks for lower spec tablets. Except no Outlook in the RT version. What's Office without Outlook? all i can is lets see how far windows RT will go but for windows 8 pro table no can come close to it. it will be number 1 for a very long time.